WELCOME TO FINNFEST USA '99! Come and join us for a celebration of Finnishness in the prime of Seattle's summer as Finns from around the world gather for FinnFest USA '99. Sunny, warm days are just about as certain as is rain in mid-winter. The flowers are in bloom, and "the Mountain is out" as we say. The beautiful University of Washington campus, with Mt. Rainier as a majestic backdrop, will provide the surroundings for a memorable FinnFest that will be talked about for years to come. ROOTS AND WINGS. 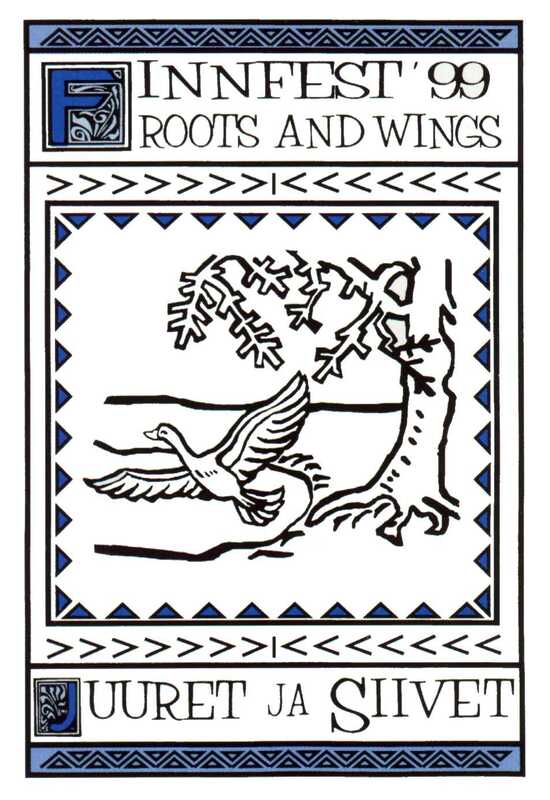 The theme of our celebration is "Roots and Wings". We want to place equal emphasis on the rich Finnish heritage both in Finland and in this country, and on the achievements of today's Finland in music, arts, scholarship and industry. We will offer you the traditional FinnFest delights of Finnish folk music and dancing, tori, and genealogy in addition to many other exciting ways of exploring your roots. You will also see the latest Finnish fashions, learn about Finland's technology achievements, view today's Finnish films and TV-programs, play sahly  or have a chance to find out what it is. SETTING ROOTS IN AMERICA. A look at the many ways Finns have made America their home: their institutions, their history, their language, their humor. Learn how to trace your roots, play a kantele, dance the Tango as only a Finn can, and celebrate your heritage with thousands of other Finnish Americans. Enjoy the best Finnish-American music around, joined by great musical talents from the Old Country. Savor the music of Finland's great composers, and join in a variety of daily worship services. Learn especially about the unique history of the Finns of the Pacific Northwest: their occupations, settlements, theater and art. ALL AGES AND ALL GENERATIONS. FinnFest USA '99 will be an event for all ages and all generations. In addition to the traditional FinnFest attractions, children and young adults will find a full range of programs geared to their specific age groups. There will be storytellers, a world premiere Kalevala puppet show, Finnish language instruction, children's songs, folk dancing, gymnastics, crafts, Kantele playing, sahly, and much, much more. We also expect some special Finnish entertainers for children. The students of Finnish at the University of Washington are planning the program for young adults. Bring your children, grandchildren, parents, aunts and uncles, favorite godchildren and other good friends! MUSICAL FINLAND. FinnFest USA '99 offers you the chance to experience the best in Finnish music: famous folk musicians like Maria Kalaniemi and Maarit Kyllonen, Petri Ikkela's tango orchestra, Seattle's own Finnish Choral Society and its unique Sauna Concert, Seattle Girl's Choir, and the Festival Concert of Finnish music by members of the Seattle Symphony Orchestra featuring the Symphony's Finnish Concertmaster Ilkka Talvi. You will enjoy! You will be proud! VIRTUAL FINLAND. Finland has never been so near as it is now in the Information Age. We're putting together a whole web of activities involving the Internet, contemporary CD technology, and interactive chat-line capabilities. Learn about surfing the net Finnish style, with a corps of friendly locals from the Pacific Northwest and as many links and destinations as your imagination can take. VISUAL FINLAND. Television, film, visual art from modern Finland gives you a look at the country from an insider's perspective: fast, integrated into the European Community but still Finnish to the core. VERBAL FINLAND. Lectures, workshops and displays that help you learn about Finland's three official languages--Finnish, Swedish, and Saami--their history, structure, and use today. Don't forget to check out the coverage of Fingliska, Finnish America's own blend of Finnish and English--a MUST SEE for every FinnFest! THE KALEVALA TURNS 150. Join Finns around the world in their yearlong celebration of the Finnish National Epic, Kalevala. Elias Lonnrot wove together the songs and charms of hundreds of Finnish and Karelian singers to create one of the most important literary works of the entire nineteenth century, a work which literally put Finland on the map for most of Europe's educated elite. While the first draft of the epic was completed in 1835, the Kalevala we read today was not completed until 1849, 150 years before our grand Seattle FinnFest. Learn about the epic, the songs and traditions behind it, and how it continues to stir the Finnish spirit today. "To be a Finn  in Finland or America  you need both roots and wings. Roots (juuret) tie you to the land that has sustained your ancestors, the rich heritage of culture, tradition, and history which makes being Finnish unique. Wings (siivet) free you to seize the world, to ride its winds to new heights of technological innovation, ingenuity, and craftsmanship. The same indomitable spirit that carved a living out of the wilderness of Europe's northern reaches lives on in Finland and in Finnish America. Our program will show those continuities and demonstrate some of the many ways in which Finns use their roots and wings both in America and in Europe." EXPERIENCE THE GREAT PACIFIC NORTHWEST! We're putting together a package of tours for those of you who would like to use this opportunity to see more of the Emerald City of Seattle or the rest of the Evergreen State, be it the open ocean, the rain forests, the high mountains or the arid plains of Eastern Washington. 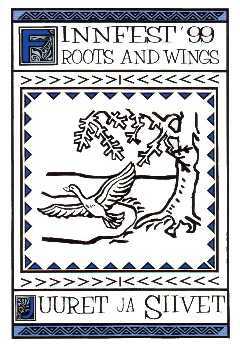 We are digging deep and letting our imaginations fly with our program theme of ROOTS AND WINGS, a rubric broad enough to encompass most all of the favorite events from FinnFests of the past and a few more besides. Here's a rundown on a few of the subthemes in the works so far; stop back frequently for updates, and be sure to email us your suggestions! REGISTRATION Even if you are a seasoned FinnFest visitor, you will need to submit your name for FinnFest USA '99 mailing list in order to recieve your registration package in early 1999. You may also use the form to request information about tours and travel arrangements. Yes! I would like to be on the mailing list for Seattle's FinnFest USA '99.